Beltone, a global leader in hearing aids, introduced the next level of hearing customization today with the HearPlus app developed for Apple Watch. Designed for simple on-the-go accessibility, the app gives hearing aid wearers new opportunities to personalize hearing aid settings directly from their wrists. Building on 75 years of innovation, Beltone's HearPlus app for Apple Watch gives unprecedented control and freedom to people with hearing loss. "The Beltone HearPlus app for Apple Watch reaffirms our commitment to bringing the most innovative solutions to our customers," said Beltone President Todd Murray. "Our new Beltone Legend™ offers the most versatile family of hearing aids to help users find their perfect match, and the addition of the app for Apple Watch means even more flexibility and lifestyle adaptability." 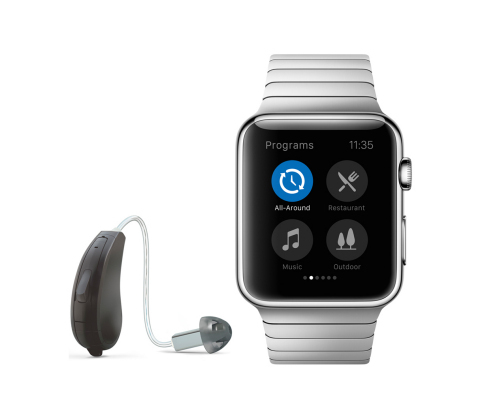 The HearPlus app for Apple Watch allows hearing aid wearers to tailor individual preferences and accommodate different listening environments in a simple and discreet way. Users will have ven more flexibility at the tap of their wrist to adjust programs, volume levels and noise reduction settings. Beltone Legend wearers will also be able to adjust background and wind noise settings and speech focus directly from Apple Watch. Users with Apple Watch can download the latest version of the HearPlus app in the App StoresSM the same day Apple Watch becomes available in stores. Recently, Beltone unveiled the most advanced and versatile hearing aids with the launch of Beltone Legend, the first Made for iPhone® custom hearing aids on the market. Beltone Legend hearing aids give users superb sound quality and speech understanding through Personal Sound ID™ and Crosslink Directionality™, two groundbreaking technologies that deliver better hearing. Added features like Smart Gain Pro and Feedback Eraser allow users to even further adapt to unique hearing environments. Visit the Beltone website for more information on the new Beltone Legend hearing aids. Founded in 1940, Chicago-based Beltone is part of the GN Hearing Care Group, utilizing advanced technology to produce hearing aid instruments sold in the United States, Canada and over 50 countries worldwide. In addition to providing outstanding service and support for its U.S. hearing care network operating in over 1,500 offices in North America, Beltone remains the most trusted brand for quality products and care among its patients and adults aged 50 and older. Visit Beltone at www.beltone.com.